Description:The Safe&Care Baby Pram Pushchairs Buggy Stroller lightweight is ideal for baby from Birth to 36 months of age or up to 15 kg of weight,which is made to give you all you need from a buggy.Specifications:Quantity: 1PC/CTNProduct Size :87x51x103.5cmCarton Size : 43.5×23.5x81cm N.W./G.W. : 8.8Kg/9.8KgFront wheels/Rear wheels: 7″X4PCS/8″X2PCSColor:GreyFunction:-Large awning design,the effective protection sun and wind effects.-Sun hood with window.-Top with skylights,to be introduced in time watch the baby moving,better care of your baby.-A key-shift function,Front cross-band intimate design,Can sit can be lying, easy to adjust, easy to fold simple.-Equipped with extra large storage basket, shopping and travel easier.-Suitable for baby from birth to 36 months of age or up to 15 kg of weight.-The locking swivel front wheels, that can freely rotate about 360 degrees, provide enormous flexibility.-Backrest can be adjusted to 3 positions:sitting,half-lying and flat.-Padded 5-point safety belt,2 safety locks.-Four wheel (2 front,2 rear)comes with a built-in spring shock absorber.-Baby seats is more spacious,the actual width of the internal 34cm, outside the width of 40CM or so,no longer crowded, cramped, which extended the baby time.-Press and simultaneously rotate the pushchairs 90 degrees.Box Contains:1 x Stroller1 x Removable child tray1 x Storage basket1 x Raincover1 x Footmuff1 x instruction manualWarning:Please never leave your child unattended!Please do not allow child to stand on seat or foot rest!Please lock all the brakes whenever you park the stroller!Please check that the pram body or seat unit attachment devices are correctly engaged before use!Please ensure stroller is completely erected and check all locks are engaged before placing child in the stroller. More Fashionable:The pram has the texture of the frame line!Endowed with dynamic wheels,decorated with clouds pattern,invariably reflects the fashionable element.The striking designs will make you as proud to push your stroller.Reject mediocrity,leading the fashion! 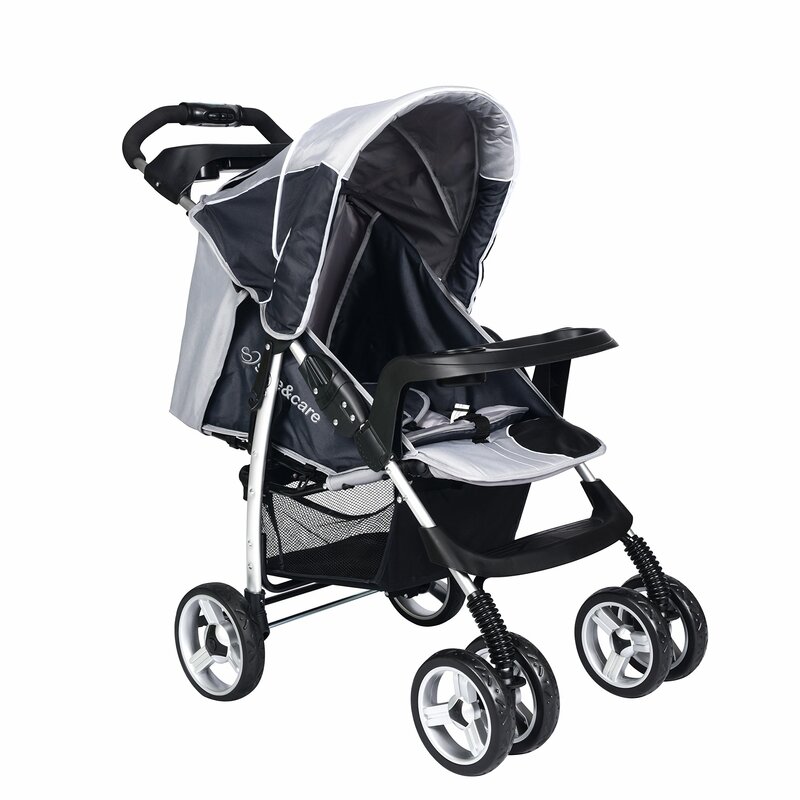 More Comfortable:Back angle adjustment function third gear to meet the baby sitting,half-lying and flat demand.Spacious and comfortable interior,feet adjustable pedal function,extending the length to bring the baby lying enjoy five-star ride. More Safe:One-step double brake,5-point safety belt, 2 safety locks, four-wheel comes with a built-in spring shock absorber. More Convenient:The light pushchairs Vehicles can be closed without bending,folding simple and easy to operate.With a large storage basket,easy to store travel items.The Baby tray to open the function to facilitate access and place cleaning.